It’s that time of year again, the start of the FA Cup, when a variety of different footballing vehicles phut through a noisy push start on the Road to Wembley. This site has dabbled in the FA Cup a great deal in the last few years, for reasons I have detailed before (such as here, amongst several others), but not in any organised way, just turning up as and when logistics and fancy lubricated it. Nowadays though, there are plenty of other sites (such as here, here and here) covering this kind of territory and no doubt, with the democratisation of prose through this ‘ere blogosphere, there will be plenty more to come. Books are being published on the back of these blog sites. Sell-out capitalist bastards. No danger of that here comrades, because all this stuff is provided, free, just for YOU! And also because it almost certainly isn’t good enough to warrant a physical tome. I imagine if Mr Penguin or Messers Faber are reading this, they are all nodding in sage agreement right about now. Also, on top of your Roads to Wembley, this coming year there will be a Road from Wembley coming to a bookshop near you. With all these other guys doing such fine work, I thought to myself, what am I left with? Surely, it’s obvious… Roads near Wembley: the excitement and intrigue of cul-de-sacs and thoroughfares within a ten-mile radius of the national stadium. As such, I’ll be writing, in detail, about Georgian Court, Tokyngton; Cornmow Drive in Dollis Hill and the southbound carriageway of the A406. Or, if you prefer, I can pen up on games taking place within that plot. 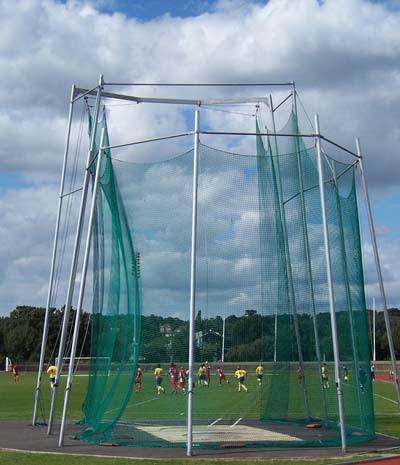 How do games in Kingsbury and Holders Hill sound? Knowing that this gambit might not last very long given the nature of the draw and my H&W season ticket limiting my options somewhat, it seemed prudent to take advantage of the fact that Sunday 17th August presented a back-to-back opportunity in the Extra-Preliminary Round. A mid-day kick-off in Kingsbury, followed by a three-mile stroll to the 3pm boogle involving Kentish Town. For no reason, lets work backwards. 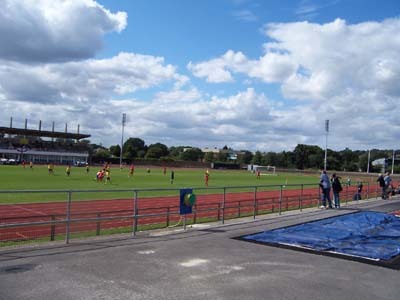 Kentish Town, as a club, are based in the relevant outpost of Camden but necessity dictates that their games are played out in the sticks, relatively speaking, at the Barnet Copthall athletics stadium. They are a new club, formed only in 2003, but with clear ambition, and unmistakably excited about this, their first foray into the wonderful world of FA Cup. So delirious are they, they appear to have door-stepped a number of relevant locals for their thoughts for the local paper and the matchday programme. These include Channel 4 newsreader and Camdenite Jon Snow who states “I have no doubt that Kentish Town FC will go all the way,” a platitude that suggests a left eyebrow raised so high as to be interfering with commercial aircraft. 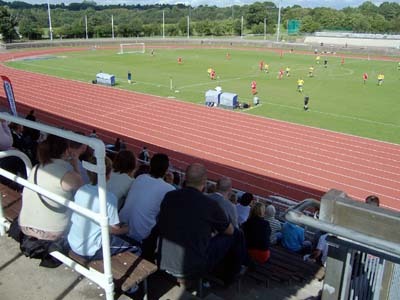 However, this is not to belittle Kentish Town, being conferred with an FA Cup entry adds an extra stripe of seniority to their sleeve, and also gives them a chance to test themselves against opposition unfamiliar from their Spartan South Midlands League-confined action thus far. 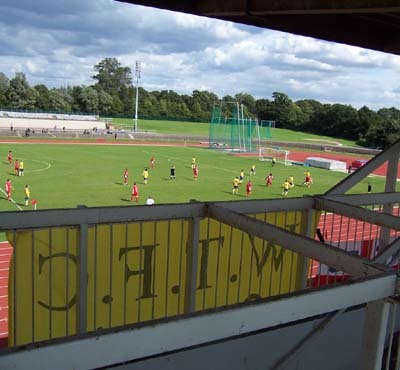 Wellingborough Town, of the United Counties League, are also a young club, being a re-incarnation of one that folded in 2002 after 145 years of existence. Despite their youth, the Doughboys attract a relatively sizeable and vocal away support who display a few flags, between two of which is a mini-scarf-and-beanie clad teddy bear clinging to the barrier with a look of giddy excitement slapped in perpetuity across his cute little mush. Also, sadly, they brought a drum. Worse, a drum operated by a child. In fairness though at least it wasn’t like a toddler crashing incessantly at a saucepan with a wooden spoon, indeed he displayed a percussive maturity beyond his years. Beats or no’, there was plenty to keep the Doughb’s excited in the first half with Darren Frost and Tom O’Brien testing Kentish Town keeper Neil McBaid early on. Boro’ were rewarded for their pressure on the half hour, McBaid unable to do anything as Frost curved a sweet right foot shoot over him and into the far corner. The travelling throng gasped with stunned delight. The home side fought back as the half came to close, a couple of successive corners eventually leading to a bit of box-bagatelle, the ball landing at the feet of Karim Essigaghie, who could only blaze over from eight yards out. However this merely served as a taster for what was to come after the break. Indeed, it was certainly time for a recharge all round. The Copthall may be a fairly bleak place to watch football, being a fairly shabby athletics stadium, but the smell of a kitchen cooking up for half-time bacon bagels covers many an evil. Aside from a gilt-edged chance for Wellingborough’s Josh Urquhart, who headed over from Ady Fuller’s pinpoint cross, despite being virtually close enough to clutch the far post, the second half belonged solely to Kentish Town. David Dawson tested Doughboy keeper Matt Finlay, while Jason Scotland-sized striker Jonathan Donaghue could only tumble over the ball like a felled Redwood after Essigaghie fired it into the mix. The locals, by this point, were getting quite excited. However, it was the introduction of substitute Javier Rivera that finally made the difference. Lively? You could have used his buzzing legs to defibrillate a fading heart. First he went close from long range then, with five minutes to go, he rose well beyond his grounded stature to flick home Sarfaz Pavino’s corner. The noise that followed is unlikely to be matched at Copthall anytime soon as clearly, from the amount of people in the home ‘end’ that called out to players by name, today’s record crowd (well, I assume, last season’s league average was 28) was made up, aside from the groundhopping fraternity, mostly of cousins, friends of friends of cousins and many a called in favour. Pavino almost won it for Kentish Town as the game entered injury time, but his shot went just over. As such, the tie went back to the Dog & Duck, Wellingborough for a replay the following Tuesday. However this tie will remain Kentish Town’s only FA Cup jaunt, for at least a year anyway, as Wellingborough made the most of home advantage, winning 2-0. They now go on to face Croydon Athletic of the Isthmian League Division One South, away from home. Words and pictures from Kingsbury London Tigers vs Eton Manor can be seen here.